The effective design of museums and libraries for children incorporates design elements and principles that add meaning to the context of the space. 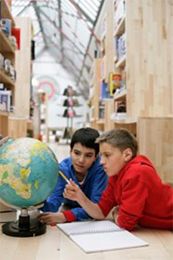 Children's experiences are enhanced when the designed setting reflects the intended concept of the library or museum. The ideal institutional setting incorporates sustainable, non-toxic materials and products for children's health benefits. All well-designed institutional settings exceed the minimal design standards for individuals with disabilities. Successful universally designed spaces incorporate aesthetically pleasing assistive devices in the space. Well-designed library settings offer children spaces for individual and group learning with chairs, tables, and floor pillows. Ergonomically correct furnishings, designed for children's smaller body types, provide comfort and support for work. A combination of natural, ambient, and task lighting in library settings provides children with balance of lighting for concentration, focus, and communication. Workstations for attention in digital areas are important for providing space for children to focus on a task. Museums are designed for people to experience science, history, or art in a given context. Both the gallery experience and the interactive experience are important for children's understanding and enjoyment of the exhibit's content. Visual exhibition design, object mounting display, and signage should incorporate imagery at a child's eye level with design principles and elements for emphasis and harmony. The design of elementary school classrooms has changed dramatically in the past decades to reflect the changing curriculum in the schools. 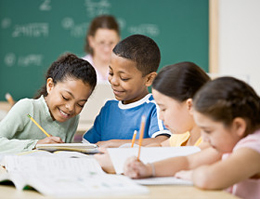 Classrooms are organized around the curricular guidelines in order to serve children and teachers in a more collaborative atmosphere. Natural daylighting, plants, non-toxic, sustainable materials and finishes are important features in the elementary school classroom. Furnishings that are appropriately scaled for young children create a more comfortable seating area for their attention to the given task or project. 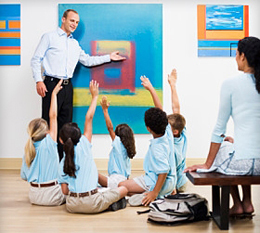 A wall painted with an accent color behind the instructor offers a focal point for children to view while concentrating on class lectures. Organized display areas developed and designed by the children in the class give them an opportunity to contribute to the designed environment.